The Northampton based driver took the crown in the finest possible style, leading every inch of the 23rd round of the series from pole position to the chequered flag. For good measure, he lowered his own circuit lap record on the way to his 12th race victory of the year. It was a copybook performance from the Ford-backed championship's season-long leader, and the 19-year-old was delighted: "It's a great way to win the championship. I decided to get my head down at the start and to push as hard as possible; I was able to get away and then relax a little towards the end." Callum paid tribute to his car, the French-designed Mygale chassis, to his engine supplier Scholar, and to his team, Kent's Jamun Racing, for whom this was a third successive British Formula Ford Championship victory: "My car has been fantastic all season and I couldn't be with a better or more supportive team. I'm delighted to have been able to repay all their hard work." 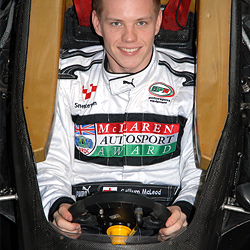 MacLeod wins not only a year's use of a Ford Focus ST road car but also a free registration into the 2008 British Formula 3 International Series. He has tests lined up with both the Fluid Motorsport and Ultimate Motorsport F3 teams and has, he says, every intention of being on the F3 grid next season.